It has warmed up today, the sun is shining, but the pile of “hot chocolate insurance” on our front lawn from yesterday is still there. Time to dust off this old post from a couple years ago, for those of my readers who weren’t around back them. Originally posted here, but here it is again. Some years back, our kids got a great idea after a snowstorm. 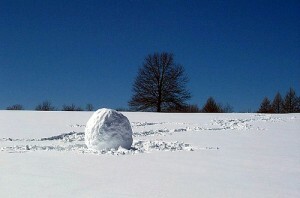 They rolled a giant snowball and left it in the middle of the front lawn. THAT would make the snow last longer, which, of course, meant more hot chocolate! It was about a week after all the other snow melted. The sun was shining, it was maybe 12-13 Celsius (around 55 Fahrenheit), and I’d gone upstairs for something. I happened to look out the window when a car stopped out front and four young men (probably aged 18-20) got out. They were pointing and laughing at our snowball, which was still perhaps 12-18 inches in diameter (edit: I’m informed in the comments it was bigger than that 🙂 ), sitting in the middle of our green lawn on a sunny day in early spring, and I was looking out the window enjoying the sight of their amazement. 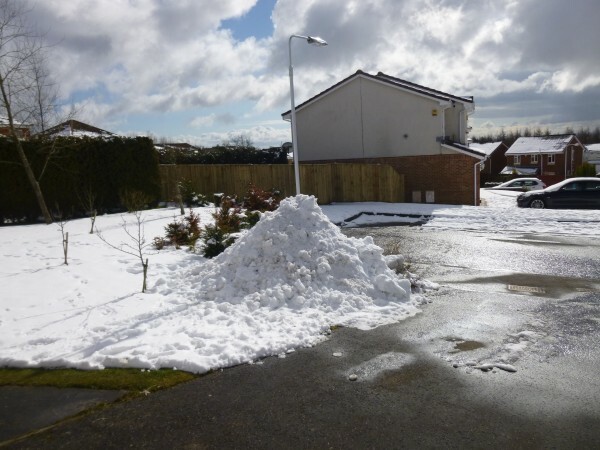 The snow from the street, the footpath, and the driveway has been shoveled onto OUR property. 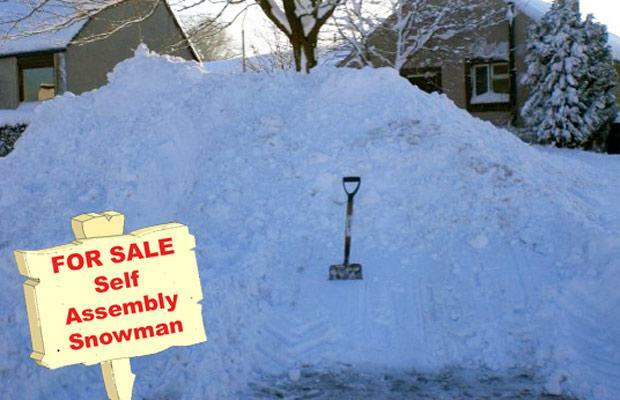 Fife Council won’t steal it this time. We got it before they could and put it where they won’t mess with it. It isn’t a snowball, so random drive-by thieves won’t be tempted. If they DID want to steal it, it’s not in a form that would be easy to steal. Though it isn’t obvious from the picture, when it gets smaller (a lot smaller), it will be shaded by the bushes. Except, it won’t be forever. In terms of the calendar year, it’s going to be gone fairly quickly, no matter how much snow we get and throw on top of it. No matter what happens, no matter how big we build it and what we do to try to protect it, by June we’ll be out of hot chocolate season and waiting for the first frost next autumn. Anyone who is counting on Mount Snow Shovel to insure that they will have “hot chocolate forever!” is in for a grave disappointment. This “Hot Chocolate Insurance” policy is going to expire — it’s just a matter of time, sun, and (especially in Scotland) rain. It’s ok, though. You reach the point of not minding too much — hot chocolate loses some of its appeal when you have it every day, whenever you want. “Hot Chocolate Insurance” is no more (or less) dependable than the things people count on to insure their own happiness — money, family, fame, pleasures, the satisfaction of having done good deeds, you name it. You can stockpile these things, try to protect them from thieves, sun, and rain, but the inevitable is still inevitable. They may seem to work for a while, but the satisfaction they give lasts only so far, and the end is coming. If your life is built on earthly treasures, you might as well have been shoveling snow. This entry was posted in Daily Christianity and tagged earthly treasure, heavenly treasure, hot chocolate, snow. Bookmark the permalink. I enjoyed this as much in review as when it was posted the first time. I remember the first winter I stayed in Scotland and the excitement at your house when the first frost/snowfall came! What fun! But what a good reminder that only things of this world only last a short time! There are so many things in life that remind us of spiritual truths, if we stop to look and think about them. You folks must visit here in May. If your “hot chocolate insurance” is gone, we’ll likely have some still alongside our woods and hedgerows. That was a fun post. We do have a graduation to go to this year, but we have a very short time, and sadly won’t make it that far north. Would hail count? We had a mild hail storm yesterday afternoon leaving about a half inch or more of pea-sized hail, and the children played in it. Even throwing balls of it at the window when a certain photographer was trying to capture their antics. It cooled off enough the hail was still on the ground this morning. Sorry, NO! I’m a tough, mean dad. 🙂 Has to be snow or frost. Maybe we’d let sleet or freezing rain count, if I were in a good mood. But we don’t get that kind of hail here, generally, either.